Britain's air traffic service said Thursday it was extending a ban on most air traffic in England until 8 a.m. EDT Friday becuase ashes from a volcano made the skies unsafe to fly. Flights to Scotland and Northern Ireland, however, may be allowed to resume. On Thursday afternoon, the air traffic agency Eurocontrol released a statement that between 5,000 and 6,000 flights of the 21,000 flights expected to fly Thursday were cancelled because of the cloud of ash forcasted to move over European air space. Eurocontrol said 50 transatlantic flights scheduled for Friday morning have been cancelled and that half of all flights from North America to Europe will be affected by the ash cloud from the volcano beneath Iceland's Eyjafjallajokull glacier. U.S.-based airlines have cancelled more than 205 transatlantic flights, reports CBS News Correspondent Elizabeth Palmer from London. Kyla Evans, a spokeswoman for Eurocontrol, said the air traffic situation in Europe "will not be better than it was on Thursday." An average of 600 flights a day fly between Europe and North America, according to Eurocontrol. The news for air travelers comes as emergency officials in Iceland evacuated hundreds of people as new flash floods endangered farms in the area near the ash-spewing volcano. The Civil Protection Department says officials are evacuating about 700 people from rural areas near the volcano, which began erupting Wednesday for the second time in less than a month. The ash cloud caused the biggest flight disruption since 9/11 Thursday as it drifted over northern Europe and stranded travelers on six continents. Officials said it could take days for the skies to become safe again in one of aviation's most congested areas. In Iceland, vulcanologists are keeping a close watch on the erupting volcano, and they think there's more to come, Palmer reports. "There are no easy options here," said Magnus Tumi Gudmundsson, professor of geophysics at the University of Iceland. "This eruption may stop tomorrow, but it may continue to disrupt air traffic for weeks or months." The volcanic cloud - too high to be a breathing hazard for humans - can be lethal for aircraft, Palmer reports. Some of the particles in it are plain rock dust, but others are jagged-edged shards of glass, which can get sucked into jet engines. The ash clogs up the plane's air intake, and the glass particles actually melt inside the engine and fuse solid. CBS News Travel Editor Peter Greenberg told CBS Radio News it will take days before air travel returns to normal. "The problem is that you're dealing with more than 6,000 flights that were cancelled," Greenberg said from London. "You're now dealing with a multiple of that number that are out of sequence, meaning the planes and the crews aren't where they're supposed to be, so you're dealing with a 36 to 48 hour and perhaps even longer turnaround time to get crews to where the actual aircraft are to get them back in position." The cloud, floating miles above Earth and capable of knocking out jet engines, wrecked travel plans for tens of thousands of people, from tourists and business travelers to politicians and royals. They couldn't see the source of their frustration - except indirectly, when the ash created vibrant red and lavender sunsets. Authorities in Ireland, Denmark, Norway, Sweden, Finland and Belgium also closed their air space. France shut down 24 airports, including the main hub of Charles de Gaulle in Paris, and several flights out of the U.S. had to double back. "It's like a tomb up there. Thousands upon thousands upon thousand of people waiting in long lines trying rebook flights from an airline that can't tell them when the planes are going to be flying again," reports CBS Radio News correspondent Vicki Barker from Heathrow. "We made it all the way to takeoff on the plane. ... They even showed us the safety video," said Sarah Davis, 29, a physiotherapist from Portsmouth in southern England who was hoping to fly to Los Angeles. "I'm upset. I only get so much vacation." The volcano triggered floods and shot smoke and steam miles into the air. Video showed spectacular images of hot gases melting the thick ice, sending cascades of water thundering down the steep slopes of the volcano. Rivers swelled 10 feet in hours. 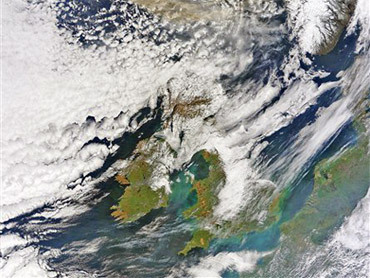 The ash cloud became a menace to air travel as it drifted south and east toward northern Europe - including Britain, about 1,200 miles away. There were more cancellations as the day went on; in Germany, airports in Berlin and Hamburg were shut Thursday evening. Eurostar train services to France and Belgium and Channel ferries were packed as travelers sought ways out of Britain. P&O ferries said it had booked a passenger on its Dover-Calais route who was trying to get to Beijing - he hoped to fly from Paris instead of London. It was unclear whether the ash cloud would affect the arrival of President Obama and other world leaders planning to attend the state funeral Sunday of Polish President Lech Kaczynski, who died in a plane crash. Explosive volcanic eruptions inject large amounts of highly abrasive ash - essentially very small rock fragments - into the upper atmosphere, the cruising altitude of most jet airliners. It can cause significant damage to both airframes and engines. In 1989, a KLM Royal Dutch Airlines Boeing 747 flew into an ash cloud from Alaska's Redoubt volcano and lost all power, dropping from 25,000 feet to 12,000 feet before the crew could get the engines restarted. The plane landed safely.